A few of the many members of the Pocket Colposcope team. From left: Rachel Barrera, Marlee Krieger, Jenna Mueller, Mercy Asiedu and Nimmi Ramanujam. According to the World Health Organization (WHO), more than 85 percent of the more than 270,000 annual deaths from cervical cancer occur in low and middle income countries. The disease is easily treatable if identified early, but because access to effective screening is limited in low-resource settings, early detection is often not possible. And even if access to screening is available, for example via human papilloma virus (HPV) testing, a confirmatory test is needed before a woman can receive treatment. In the United States, this test is performed through colposcopy. However, a clinical colposcope is typically not available in a primary care setting, and in many low and middle income countries, often the alternative is to visualize the cervix with only the naked eye—a method that often results in missed diagnoses. The cost of a clinical colposcope—upwards of $20,000—presents yet another barrier. The Pocket Colposcope is designed to address these barriers. It brings that secondary test—traditionally performed using a clinical colposcope by physicians at referral centers—to the primary care setting. In addition, it’s easy for a broad range of health care providers with different levels of training to use. After four generations of development, the team has created a beta prototype of the Pocket Colposcope in collaboration with product design and development company 3rd Stone Design, Inc. The Pocket Colposcope is significantly less expensive, smaller and lighter than a traditional clinical colposcope. Weighing less than two pounds, it fits inside a pocket (hence the name). 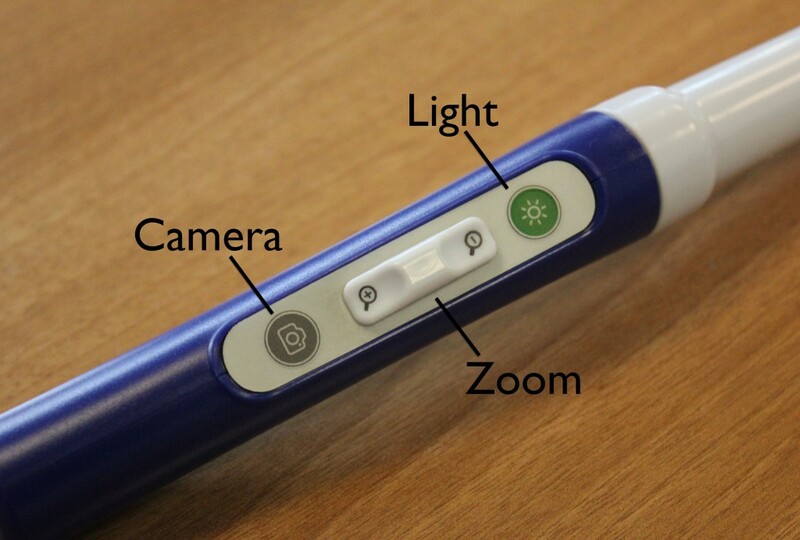 The device enables healthcare providers to zoom and capture images by pressing a button with their thumb. Images taken with the Pocket Colposcope are transmitted instantly to a smartphone, tablet or laptop. Afterwards, the device can be sterilized by immersion in bleach or hydrogen peroxide. “What’s unique about this design compared to traditional and redesigned, low-cost colposcopes on the market is that it reimagines the way a gynecological exam is performed,” said Ramanujam. Rather than visualizing the cervix from outside the speculum (the instrument that separates the vaginal walls during cervical exams), as other colposcopes do, the Pocket Colposcope can be used inside a speculum or even without a speculum. Traditional colposcopes have a camera and light source and a binocular viewing system to examine the cervix. Thus the colposcope is external to the cervix. The Pocket colposcope does not have a viewing system, but rather has a consumer grade light source and camera at the tip, that when inserted can provide a live video or image of the cervix on a laptop or tablet. The ability to insert the colposcope through a speculum enables a close-up view of the cervix (three centimeters rather than 30 centimeters away from the cervix), alleviating the need for high-end optics and high-resolution cameras, which make traditional colposcopes expensive. The Pocket Colposcope provides image quality that rivals the best colposcope on the market. Side-by-side images read by an expert shows that the images obtained with the Pocket Colposcope result in the same diagnosis as a high-end clinical colposcope (Leisegang Optik). The Pocket Colposcope is currently being used in clinical investigations in hospitals in the United States (112 patients), Peru (149 patients), Kenya (100 patients) and Tanzania (27 patients) and will soon be implemented in studies in Honduras. An article describing some of these results is currently in press with the Journal of Lower Genital Tract Disease. John Schmitt, professor of obstetrics and gynecology and global health, will be presenting research results at the International Federation of Cervical Pathology and Colposcopy World Congress in April. Ramanujam will present the team’s findings at the Congreso Internacional de Colposcopia y Patologia del Tracto Genital Inferior in Lima, Peru, in May. Ramanujam’s team is comprised of Duke faculty, staff, postdoctoral researchers and students, including several current and former Master of Science in Global Health students and a few undergraduate global health majors. What’s Next for the Pocket Colposcope? Ramanujam and her team are currently working through the regulatory process for the Pocket Colposcope. Meanwhile, they’re trying to form new partnerships for population-level studies in low and middle income countries. “Our partners who use the device in their communities are the ones who will demonstrate its impact to prevent cervical cancer,” said Ramanujam. To learn more or inquire about partnerships, contact Marlee Krieger at marlee.krieger@duke.edu. To date, development and testing of the Pocket Colposcope has been funded by the Duke Global Health Institute, Duke University and the National Cancer Institute. Two of the team leaders, postdoctoral researcher Jenna Mueller and research project manager Marlee Krieger, are seeking additional funding from the National Institutes of Health to advance the project to its next phase in Peru and Honduras. This spring and summer, through the Bass Connections program at Duke, a faculty-student research team will be exploring how to increase adoption, distribution, and acceptance of the device in Peru. They’ll meet with stakeholders—policy makers, manufacturers, distributors, clinicians, patients and others—to identify bottlenecks to consider in the development and marketing of the technology. The team’s work hasn’t ended at the colposcope. Using a human-centered design process—an approach driven by the needs identified by individuals who will be using the product—they’ve developed a more woman-centric replacement for a traditional speculum. Traditional speculums can be uncomfortable, and women’s aversion to them can be a barrier to seeking care, so a more comfortable instrument could increase screening uptake. The device is currently in clinical testing; in a volunteer study, it was strongly preferred over the speculum. The speculum-free inserter next to a penny, shown for scale. The team is also developing a low-cost cervical cancer treatment that delivers gelatinous ethanol to the lesion site. This method does not need electricity or hard-to-obtain products that are required for traditional treatment approaches. To learn more about the project or inquire about partnership opportunities, visit the Center for Global Women’s Health Technologies website. Duke students: To learn more or apply for the Bass Connections project, visit the Bass Connections website. 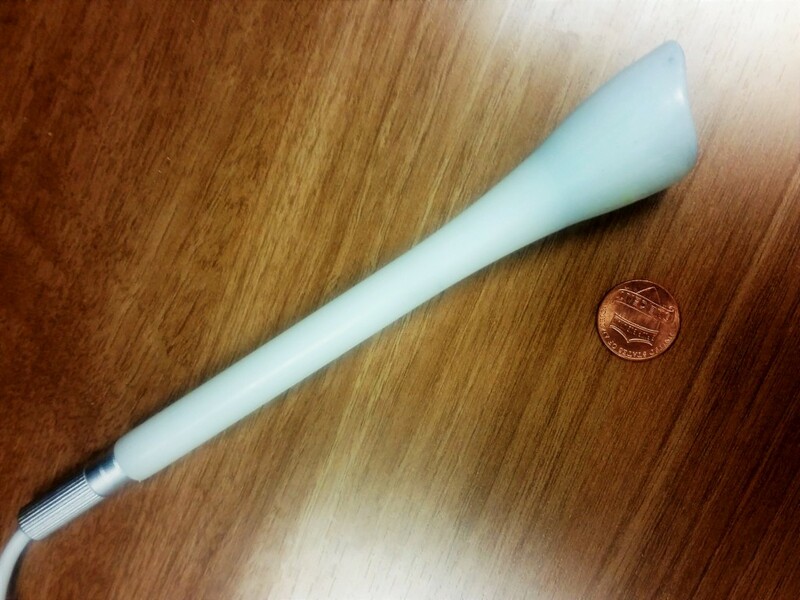 Pocket Colposcope (Beta Unit), a low-cost, easy-to-use portable cervical cancer screening and triage device. Photo credit: 3rd Stone Design, Inc.
What’s unique about this design compared to traditional and redesigned, low-cost colposcopes on the market is that it reimagines the way a gynecological exam is performed.